An Oklahoma State Trooper, Marvin Culver, took his family to Crater of Diamonds State Park in Arkansas. This place is an old mine site, I think, and what they do is allow the public to do some prospecting. And old Marvin bagged himself a 4.2 carat diamond, the 17th largest ever found there. 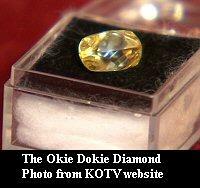 (The largest was 40 carats!) Worth $3000 for starters, depending on clarity etc. Nice way to spend the day, eh? I love those conumdrums! What is, is not, because it is. He taught even the emptiness of his own teachings. Having said that, Diamond Sutra is still a bit of bafflement to me. I'm sure Lama Phuntsok would say, "More meditation..."
Is Diamond Sutra a book or a philosophy? Is it about not understanding understanding, about finding and letting go? Is it about going places without moving your body, about being there but not... I wonder, is Richard Bach a Buddhist? Diamond Sutra is both book & philosophy. There are several translations available. You can probably even find it online by Googling "Diamond Sutra". Sutras are the Buddha's teachings. The Sanskrit title of the sutra translates fully as The Diamond That Cuts Through Illusion. Ultimately, I think, all sutras are about finding and letting go, though perhaps not in the way you think. The idea is to let go of all concepts, since, according to Buddha, ultimate nature of reality transcends any notion of concept. Neither good nor bad, nor lack of good or bad. "Thusness" is another term used. It is what it is. I don't know if Richard Bach is a Buddhist. I did hear from a reliable source that David Emmerson, that former Gliberal cabinet minister who became a Constipated cabinet minister in that post-election fiasco is a Buddhist. Go figure. Maybe one should not say then that one is a Buddhist. That in a way is a concept? Maybe one should say, I am untrying to be a Buddhist? There are those who wanted to see in Jonathan Livington Seagull the Jesus figure. More so I think this gull would be Buddistic. One of Richard Bach's way of thinking is that you do not need to travel. When you think yourself there, you are there. It's a state of mind, non physical. But it takes a lot of work, (meditation?) to get there. Maybe stating you are a Buddhist, like David Emmerson, is a step to the road of failure? It's trying to set something in stone? I wonder how Leonard Cohen is handling that. One of the things that keeps us tied to illusion is our tendency to label things. To give them names. Then we associate that with a conceptualized notion of what these things are. They become solidified this way...sort of like something set in stone. One of Lama Zopa Rinpoche's teachings dealt with this. eg. learning the alphabet. Say you've never seen an A before. What is it? 3 straight lines in a particular configuration. As soon as you learn it's an A you can never again see those 3 lines (even with minor variations like font, size, colour, angle, neatness) without thinking "A". Makes me wonder about Yahweh telling Adam and Eve to give the other animals names. What was he doing? Leading us into temptation? A word is just a word. It is what that word conveys to us where it is all about. The word itself is worthless. A way to communicate impressions is to make them recognizable. Language and naming things is such a way. Most of us are aware that when we say something is red, and another person picks out the red, calling it the same, that there is no way of knowing that we actually see the same colour. Once I entered a park. Saw in the distance a hump. My first thought was turtle. Somehow I did not think it would be a turtle. So I though boulder. Approaching it I switched several times. It turned out to be a huge turtle. If I hadn't known the name turtle, or if I had never seen a turtle even, how could I tell you about it? That,I think we need to be aware of. Names are just that, names. Words are just that, words. Numbers are just that, numbers. They are tools to convey the meaning behind them. They are tools to arrive at a concept. A temorary frame around a thought, an impression. Tools to help us communicate. Suddenly that reminds me of something I wrote a long time ago. I made a booklet of little philosophies of such nature. No form of life should be/boxed in. A vision may/be temporarily framed to/emphazise the beauty/of a single image, but/around every idea there/should be space, for/life is a host of images,/delicately shifting into/integral patterns;/fast flashes upon our senses, never to be/ captured and held. Richard Bach must be Buddhistic. He wrote "Illusions" . About a reluctant messiah. He writes such things as, "A cloud does not know/why it moves in such a/direction and at such/ a speed,/It feels an impulsion...this is/the place to go now. But the sky knows/the reason and the patterns/behind all clouds,/and you will know, too, when/you lift yourself high enough/to see beyond/horizons." I would not want to totally meditate reality on earth away to enter a higher consiousness. I love so much of all that solid stuff, like trees, rocks, natural things. I figure that all this are experiences to learn. When we deny them, when we only look through them, we refuse a gift. "The world/is your excercise-book, the pages/on which you do your sums./it is not reality,/although you can express reality there if you wish./You are also/free to write nonsens, /or lies, or to tear/the pages." One more:"Here is/a test to find/whether your mission on earth/is finished:/If you're alive,/it isn't." I am alive. I want the Earth experience. I hope that I always can remember that everything is of a temporary nature. That solids are temporary frames, to crown a situation, but not a jail sentence. Hi guys, you are truly diamond! one in the same everything and nothing..